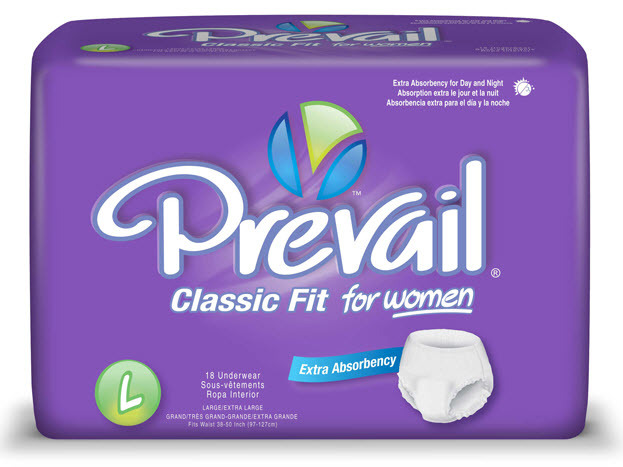 Anyone that is suffering from incontinence will find relief by using Prevail adult diapers. Prevail diapers come in a variety of sizes and absorbency options, making them a wonderful solution for anyone that is hoping to gain their dignity back. Trying to find the right adult diapers to wear can be difficult as some do not fit properly and others will cause you to have issues with skin rashes as they can rub against your legs. Preventing a skin rash is one of the best things you can do for yourself to make sure you are comfortable in dealing with this condition that is already quite embarrassing for many people. The good news is you are not alone! Millions of Americans suffer from incontinence and this number is expected to increase as the baby boomer generation is aging and more people are starting to have troubles with bladder control. Prevail diapers can give you the ultimate level in comfort and protection. There are several options that you can use, which can give you discreteness in addition to being able to capture urine loss that occurs. Prevail diapers also come with many options for both men and women. This is great as you don’t need to deal with diapers that are just a one-size-fits-all solution. General neutral products will not be able to provide you with the right level of protection that you need. Having a custom fit to your body is the best way to prevent leaks from happening along with to protect you from having a skin rash where the diaper fits snugly against the legs. One of the most popular products that Prevail offers is the Prevail Breezer line. This line has options for men and women and it’s quite popular due to the odor shield that it includes. Since odor often comes along with incontinence, it is important to have a product that will keep the smell inside the underwear! You don’t want people to be able to sniff out your issue with incontinence as you are trying to continue enjoying your social life! Another great feature of the Prevail diapers is the extra layer of fabric that is included. This helps to provide additional protection along with discreetness as many products are made with plastic liners. The plastic liners can actually cause you to have troubles as you can hear them when you walk. They can also get hot against the skin and this can cause you to have sweating, which causes rashes and it makes wearing products uncomfortable. Preventing rashes is important to managing incontinence correctly. When you do not wear Prevail products, you can increase your risk of a rash as Prevail has taken extra measures to help in providing additional air to the skin. Keeping air flow will reduce a skin rash and also aids in keeping you from having odors that buildup. Purchase Prevail products online for greater convenience. You will have a larger option of products to choose from when you shop online and the prices are typically better than what you will end up finding in a store. It is important to try out several different types of adult diapers to find the one that does fit to your body style correctly and to find the adult diapers that are the most comfortable. Get samples to try before you buy. Prevail adult diapers are designed to look just like your regular underwear. This type of discreteness can keep others from detecting that you have an issue and allows you to properly manage incontinence. There are also adult diapers that you can wear at night. They include the same features as the Prevail Breezers but they include additional absorbency to keep you dry for longer periods of time.